When you are a singer, recording is a major part of your work. Different studios have different acoustics and this affects your sound quality. Though your voice is the same, other elements play a major role in producing a desirable output. While your technician, speakers and the room acoustics are important, the mic is also an integral part of your recording. A good mic can enhance your voice and give emphasis in the right areas. While a bad mic can make your voice sound too thin or sharp. In order to ensure the mic does not cause any havoc with your voice delivery, you need the best microphone for recording. These are three of the best microphones for recording purpose. For recording, the mic should be able to isolate your voice and lift it up in such a way that you sound better and richer. The quiver or gruff in the voice needs to be toned out, so that the recording is even and flawless. Here is a detailed review of the three best microphones for recording. This brilliant microphone (Shure SM7B) from one of the most renowned makers in the world is definitely a worthy buy. Equipped with a cardioid polar pattern, this mic picks only voices that are directly delivered into it and eliminates the surrounding noise. You can use this mic even for two people performing side by side, as long as the voice is delivered into the mic. When you are recording, you talk or sing directly into the mic, thus resulting in plosive sounds and heavy breath noises. This mic is equipped with a windscreen, which filters out this sound and delivers only your clear voice. There are two different windscreens provided with this mic, which can be attached and detached as you please. When you are in a recording studio, there are a number of other noise sources, which can get picked up by regular mics, thus making your recording futile. This mic ensures all the unnecessary noise is filtered out and your voice is carried out clear, crisp and deep. The cost of the mic is much lesser than others in the market with similar features. It in fact is reported to deliver better sound quality than some of the higher priced mics. For a dynamic mic, it delivers a very well balanced and flat sound which is very important while recording. 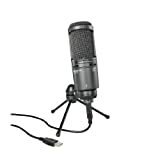 The Audio-Technica AT2020USB microphone from Audio Technica is a classic condenser mic which can also be used for digital recording with the help of the USB. It comes with a 16 bit AD converter which delivers very high quality audio. This condenser microphone with a cardioids polar pattern can pick up sound that is delivered directly into it, very clearly and filter out the other unnecessary noise. When only your voice is picked and enhanced, the recording is very clear and requires very little editing and tuning to cut out the external sounds. The mic has mix controls which can be adjusted to blend in your microphone audio with the audio that has already been recorded. This way, you can add on to the pre recorded audio without any noticeable difference. There is a headphone jack in the microphone, along with volume controls. When you are recording, you can adjust the volume in such a way that your own voice doesn’t disturb you, yet is clear enough for you to gauge your performance. Also, the internal amplifier for the headphones delivers superior quality sound. You can also plug in your headphones and listen to your playback, without having to switch devices or step out of the recording room. This large diaphragm condenser mic from Oktava is a classic microphone for studio recording or even for broadcasting purposes. The design of the Oktava MK-319 has been improvised in such a manner that the sound refraction is cut down. This results in a smoother and better sound quality. The diaphragm which is the most important factor in a mic is made of gold sputtered Teflon, which delivers better sound. The voice transmitted is not only smoother but is clearer and warmer, making it sound very natural. It is not only suitable for vocalists, but also for guitarists and other instruments that require clarity in sound delivery. This model is an improvement to the older version and has a new, acoustically designed body which cuts down the sound refractions. The new body is also more rugged and shock resistant, thus making this mic more durable and reliable. Though this is only an improvement to the older version and still uses magnetic reed switches, this microphone can delivery very clear and smooth audio which is very important in any recording. When it comes to recording, the mic you use needs to be carefully chosen. The choice does not depend just on the brand or the technology used. It also depends on your requirements. If the mic is able to deliver the voice with clarity and no background noise, that is the perfect mic for you. For when you are recording, you don’t want the surrounding noises to overpower your own voice. Different recordings require different types of mics. However, any mic should be able to enhance your voice and help balance the delivery. A mic with a windscreen like the Shure SM7B will enable you to record only your voice, sans the breathing sounds. When you give a break and start talking too close to the mic, plosive sounds are emanated. This windscreen ensures those sounds are cut out and only your voice is delivered. Choose a mic that suits your need and always keep your acoustics in mind. Closed space requires different mics than open spaces. Hence the best microphone for recording needs to be chosen carefully to ensure you get the desired results. Top 5 most recommended vocal mics list!